Sometimes a recipe turns out exactly as you expected. Other times, you decide to go in another direction. Today’s recipe is one of the those latter times. I originally developed this recipe so I could showcase my new-found love of Burrata cheese. Burrata cheese is similar to fresh mozzarella, but wayyyy creamier. It has changed my world forever and I want to shout my love of it from the rooftops. But as I was making this pizza, I quickly realized that I already had too much going on with the ricotta, shredded mozzarella, and Pecorino Romano cheese, so there really was no room left to add slices of fresh Burrata cheese. So I just left it at that. My missteps turned out to be a HUGE success because this pizza was absolutely out. of. this. world! Chewy, yet crispy crust, and a combination of three of the best Italian cheeses?! It’s no surprise that this pizza is this amazing! But sadly, I’ll have to wait for another time to share my love of Burrata cheese with you. Stay tuned! If you haven’t had pizza bianca before, it’s also known as white pizza. Does that sound more familiar? White pizza is simply a pizza without any sauce – yes, that also means absolutely no WHITE sauce. I have tried some white pizzas that use an alfredo-type white sauce and they are simply too rich. So don’t expect any of that on this pizza. If the thought of having a pizza with no sauce sounds insane to you, don’t leave yet! I promise you’ll be more open to the idea after you learn more. So what makes this pizza so amazing? Let’s break it down. Structure from the shredded mozzarella – the way this cheese melts together in one cohesive piece, while still super gooey, is exactly the reason why we don’t need sauce on this pizza. I promise you won’t miss it! Creaminess from the ricotta – if you’re like me, those pockets of creamy ricotta cheese are my favorite parts of gourmet pizzas. There just ain’t anything like warm, creamy ricotta. Excuse me while I start drooling. Bold flavor from the Pecorino Romano – Mozzarella and ricotta have mild flavors so I sprinkle on some Pecorino Romano cheese to add some more bite. Pecorino Romano looks like Parmesan but it’s a little tangier and saltier. So that’s why I think it’s the best choice for this pizza. To add a little bit of freshness, I drizzle a little extra-virgin olive oil on top and place a few fresh basil leaves around, which also adds the perfect amount of color. Side note: I just began growing my own fresh basil in my “garden” – which is just basil right now – and it’s so amazing! I love having it on hand to use in any and everything. I’m hoping to add mint, thyme, and rosemary plants to truly turn this area in to a real garden. If you have any tips about growing these, send them my way! When buying store-bought pizza dough, you’ll usually find it in the bakery refrigerators. If you haven’t tried rolling cold dough before, it’s impossible! Therefore, before you plan to make this pizza, place it in a medium bowl with some olive oil (this keeps it from sticking to the bowl AND gives the dough a crispy crust when baking) and coat the dough evenly. Let it sit on the counter for an hour or two to help it get to room temperature. Now, it’s ready for use and will be super easy to roll into a pizza round. Like I always say, don’t buy your cheese pre-shredded! There are additives in shredded cheese to keep it from clumping together, which also keeps it from melting nicely. Therefore, I always shred my own cheese. They sell blocks of mozzarella in the cheese section – but don’t use fresh mozzarella since it will be impossible to shred (too soft). I used this kind from Polly-O, but any brand is perfectly fine. Let the pizza cool for a few minutes before slicing and serving. Otherwise, you’ll have a huge mess and the toppings could slide off. There you have it – the BEST pizza bianca you will ever have! Let me know what you think in the comments below! The BEST white pizza you will ever make! Made with store-bought dough, shredded mozzarella cheese, ricotta cheese, and pecorino romano cheese, this pizza is super simple to make and will be best addition to your weeknight dinners. Remove pizza dough from fridge. Place 1 tablespoon of olive oil in a medium bowl. Add pizza dough to bowl and toss in oil. Let it sit at room temperature for 1 hour to warm up. As the dough warms up, it will grow, which is good. Preheat oven to 450 degrees. Mix ricotta cheese with minced garlic, red pepper flakes, and salt. Set aside. Punch dough down with your fist to remove air bubbles. Place pizza dough on a large baking sheet and spread with your fingers until dough is 1/4 inch thick, leaving a slight lip around the edges for the crust. Sprinkle shredded mozzarella over the crust, leaving a inch clear from the edges. Then, place ricotta cheese mixture on top, in 6 dollops. Next, place basil leaves all over the pizza. Finish with sprinkles of Pecorino Romano cheese and drizzle of last tablespoon of olive oil. Sharon, it’s really awesome! This will quickly become a favorite in our house! Sharon, thanks! Very tasty pizza turned out. Very cool photos! So glad to hear that Alyssa! Thanks for taking the time to stop by and leave some feedback! Thank you!! I just made this with a pre-made frozen cauliflower crust and it was phenomenal! This was my first attempt at a white pizza. I followed the recipe exactly. It was perfect. Made this tonight and it was perfect! My husband and I thought it was even as good as our favorite Mellow Mushroom pizza which is the Holy Shitake Pie! Loved it and will add it to our rotation. Also can see several ways to add other twists and flavors too. Thanks for the recipe! Yay! I am so glad you both loved it! Let me know what twists and flavors you add to it – I’m always looking to try new things! with spinach, another classic topping for white pizza. I’m limping along with my basil but in South Florida the basil downy mildew has become a huge problem. I can’t bring myself to buy it in the store yet. Aw I’m sorry. Do you normally like ricotta and you just didn’t like it this time? Or do you not really like it regardless? Made this tonight and it turned out magnificent. Very easy to put together and ingredients were readily on hand; I even made ricotta from scratch and the whole thing was easier than any other pizza I’ve made. The only thing I did differently was to add basil fresh after I took the pizza out of the oven. I think the fresh basil adds a lot of depth. Thanks so much Sharon for this great share! Yay! I am so happy to hear that. I need to try the basil fresh next time, for sure. I made this for pizza night with a couple of friends and it was such a hit! Thanks! I had some left over shrimp that I had sauteed in olive oil and Old Bay seasoning which i chopped up and spread on top of this pizza. It was fantastic. Oh wow! Love this tip! coming over tomite and wants to make pesto focaccia recipe that she saw. I think we will make this pizza putting a layer of pesto first then all the yummy cheeses. I will let you know how it turned out. What a great idea! I am obsessed with pesto so I gotta try this out next time I make this! Can’t wait to hear how it turned out! home made dough is easy…two things you need…high gluten(or protein) dough and time. which if you are buying store bought you have the time. I don’t waste time mixing or kneading…the rising does it for me. So my recipe. half as much water as flour(usually 4 or 6 cups)….some salt, teaspoon yeast(stopped using olive oil a while ago)…stir a bit till it is all mixed…hour or two on the counter….overnight in the fridge…. better than store bought…no kneading or mixer. I get a 50 lb bag of high gluten flour at a local store cheap….and use if for like 2 seasons. keep about 1/3 in a large seal-able tub. Use it for focaccia(cover with aluminum tray, pizza(toaster oven 2 cycle at max) and bread(cook in dutch oven, roll in ball let rise for 4 hours in dutch oven after taking out of fridge) cook 1 hr 400F-425F…or more if larger. Never mix or kneed. Just shape. Definitely reaching for my drool towel for this pizza; loving all different flavors of rich and gooey cheese here. Nicely done! Thanks Dan!! It’s one of my favorite dinners, for sure! What brand dough did you use? I just went to my local Walmart and got pillsbury thin crust. It Didn’t want to really roll out. I used fresh dough from the bakery of my supermarket. But you can certainly use the Pillsbury dough. What do you think about adding a good quality thin sliced Italian ham and spinach? Do you think that pair ok? Hi Lori! I definitely think so. But don’t add too much extra or it might weigh down the pie too much. Oh, my goodness! I’m sooo drooling right now. Look at the cheese. Thanks for sharing! This pizza looks soooo good! I love fresh basil leaves, and basil on pizza is the best! Already pinned to try! Drooling! Totally making this this weekend. Wow, this looks and sounds so delicious and indulgent! I love pizza bianca. Yum! Ahhh…this looks mouthwatering and delicious!!! Wow that looks so satisfying. I prefer white pizza to red most days. Nice!!! I have been the same way. Once I had it without that rich alfredo sauce, I was hooked on white pizzas! This looks absolutely mouthwatering–I want to eat it through the screen! And I’m going to try that steak and blue cheese pizza, too. Aw thanks Jazz! You’re gonna love them both! Yum!! I am now craving pizza! This looks delicious. Ooo it all looks fantastic! I would love to try and make that pizza! I cannot get over how cheesy this looks!!! Pinning to try! Woohoo! Cheese is the best, right?! This looks delicious! I wish we’d made this instead of ordering in tonight! Aw man! Keep it in mind next time! Wow I make pizza so much, I can’t believe I never thought of this! Looks sooooo good! This looks outta control amazing!! I am a seriously cheese lover so I have to try this. Thank you! Oh my gosh this looks SO good! I’m not a huge sauce fan, so this would be perfect for me! Definitely! Hope you get to give it a try soon! This looks so amazing!! Yummy! Holy macaroons, that looks unbelievable! 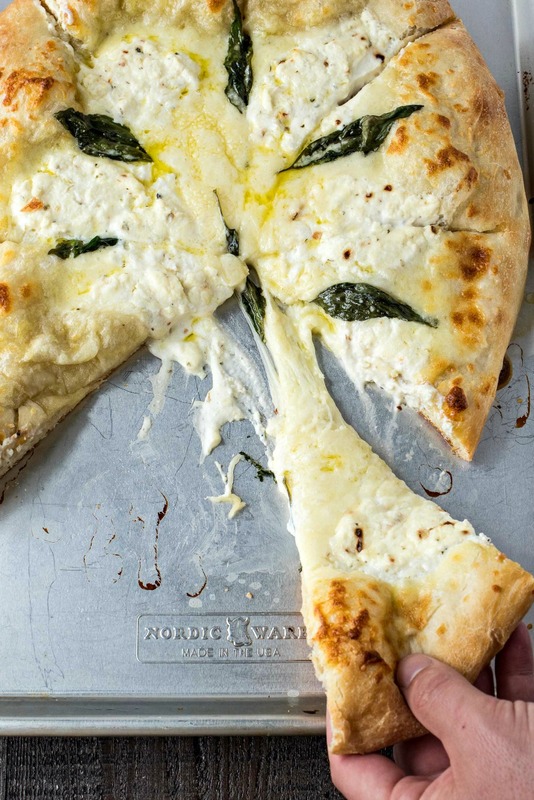 I am a huge white pizza fan, because, really, what else do you need besides bread, cheese, and a little olive oil?!?!? I’m going to have to add this to my dinner rotation immediately! Yessss! I completely agree with that! Hope you love it! OMG these look incredible. I have to try the white pizza! Thanks so much for sharing! You know my husband and I make pizza at least one a week, but we’ve never made a bianca at home. The very sight of this has me drooling, though, so pizza bianca must be made pronto! Yay! Let me know how you both like it!! This looks AMAZING! All of that cheesy goodness, I’m drooling! I’m always looking for ways to change up pizza night!This looks delicious!!! I love having fresh herbs in the garden. Just be careful with mint. It spreads, so if you don’t have an area where you can allow it to spread, plant it in a container. Thanks so much! And that tip for the mint is GOLD! I’ll make sure to keep it in it’s own planter.